This part was written by Sander Lourens and Ron Meijerhof (Poultry Performance Plus). Title was "Yolk as the fuel for embryo metabolism". 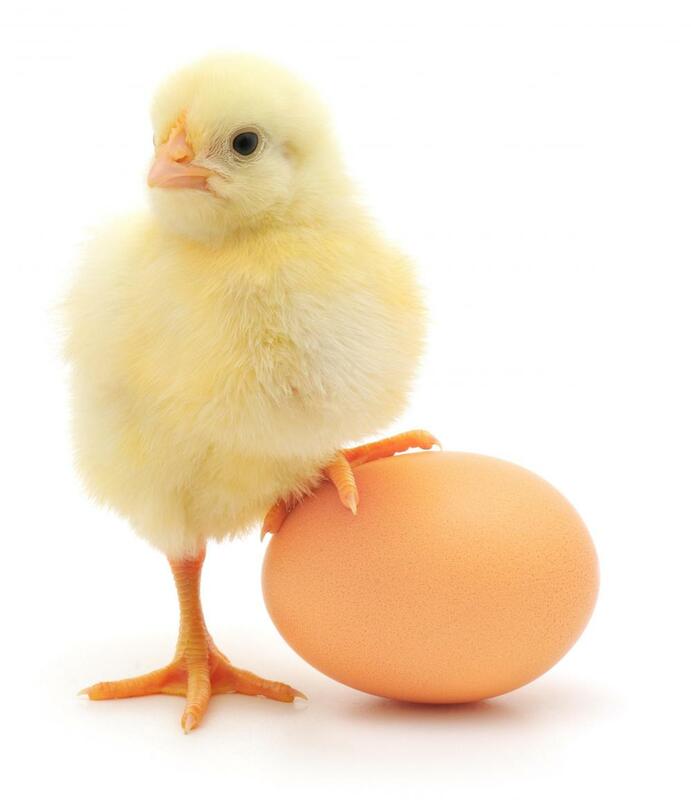 During incubation, yolk and albumen from the egg content are used by the embryo to build up its own body. For this process, energy is needed. The energy that is needed is stored inside an egg at start of incubation. During development, the embryo uses mainly the protein (from albumen and yolk) for building up the body tissues, and gets the energy needed for that process mainly from burning the yolk fat. During this process, the embryo consumes oxygen and produces water, carbon dioxide and heat. When the body is build up and the embryo is ready to hatch, a fraction of the yolk remains unused and can be found in the new born chick as residual yolk. The logical consequence of this is, that a chick with more residual yolk at hatch used relatively less nutrients for growth and development. The question can be raised: would it be better for the embryo to utilize more yolk, and as a consequence have less residual yolk sac. Or in other words: the less residual yolk the better? A fertile hatching egg comprises shell, yolk and albumen and a viable germ. During incubation the embryo develops its body from the contents of the egg, using energy obtained mainly by burning yolk fat. This process also produces waste products: carbon dioxide (CO2), water (H2O) and heat. To incubate successfully, environmental conditions have to be created that facilitate this process. At hatch, a certain amount of yolk is left unutilised in the yolk sac. 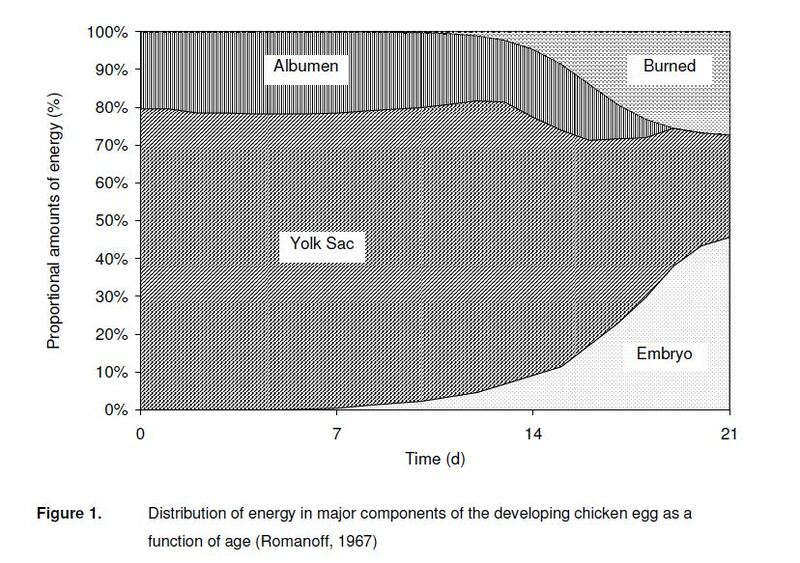 The distribution of energy in major components of a developing chicken egg as a function of age is in Figure 2. Yolk and albumen are used to build up the body of the embryo. The proportional amounts of energy that are lost to the environment and that can be summarised as “burned”. The quantity of residual yolk however is not as constant as is shown in Figure 1. Some chicks are born with more residual yolk than others. It can be expected to find a lower yolk-free body weight in a chick that has a large residual yolk; this chick also burned less energy. 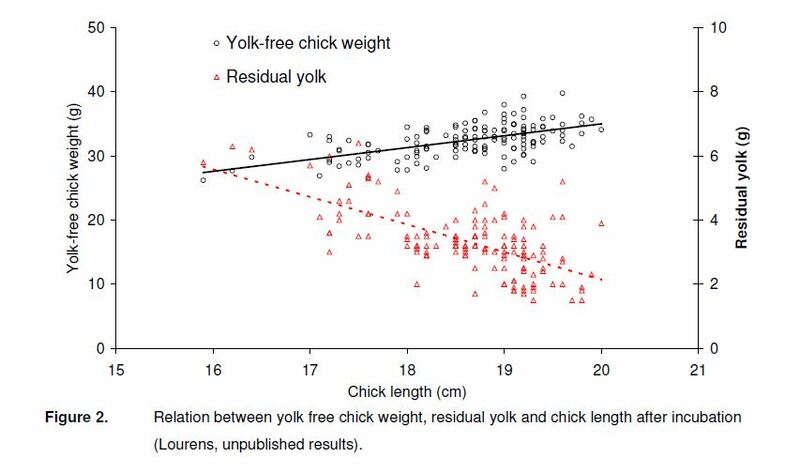 The relationships between yolk-free bodyweight, residual yolk weight and chick length are in Figure 2. Data are from chicks that hatched from eggs produced by a high yielding broiler breeder flock at 30 weeks of age. The amounts of residual yolk varied between 1.5 and 6.5g and it can be seen that chick length positively correlates with yolk-free body weight and negatively with residual yolk weight. It is logical to assume that a better development of the chick during incubation would result in more grams of yolk free body weight. As yolk free body weight and chick length are related, it seems that chick length (from beak to toe in cm) is a good non-destructive indicator for embryo development. From the above it can be concluded that factors that influence oxygen consumption, carbon dioxide production, metabolic water production and heat production, also influence yolk utilisation and embryo development. It is widely recognised that embryo temperature is the key factor in incubation. Embryo temperature is the result of the balance between heat input and heat output. Besides increased metabolic water and carbon dioxide production, also more metabolic heat is produced when more yolk is used for growth and development. This extra metabolic heat should be removed from the eggs to prevent the embryos to overheat themselves. And because of the balance between the input of oxygen and the output of waste products, also increased metabolic water and carbon dioxide should be removed sufficiently from the eggs. But first priority is embryo temperature! Factors that influence heat production negatively, are increased storage time or the lack of turning during incubation. Chicks from long stored or unturned eggs hatch later, which can probably be explained from the lower embryo temperature caused by decreased heat production during incubation. These chicks will most probably have large residual yolks and small yolk-free body weight, but research in that direction is unknown. Too low and too high embryo temperatures also negatively influence heat production. There has to be a certain optimal temperature zone where yolk utilisation and heat production are highest. The less residual yolk the better? Embryos with large residual yolks at hatch did not efficiently use their energy to gain a high yolk-free body weight. Embryos with large residual yolks produced less waste products a consequence. For optimum development, a high metabolic rate is required, that can be measured from high heat production. Because heat production directly influences embryo temperature, the transport of heat from the egg to the environment should be sufficiently. Chick length measurements provide very informative data on the quality of the incubation process and is positively related to yolk-free body weight and negatively related to residual yolk weight. Longer chicks consumed more energy, produced more heat, are in a further stage of development, have better gut health, a more advanced immune system, are more yellow beacause yolk pigments moved to the feathers. So life is better with less residual yolk! Innate immune function affected by EST!